All the major players want a piece of the pie, however you view those realities. From Apple's ARKit launch and goal for breakthrough AR headset technology by 2019 to Google's parallel launch of ARCore bringing augmented reality apps platform to smartphones, AR is poised to open a myriad of users to the immersive experience spectrum. Facebook's release of Oculus Go standalone VR head set reinforces Zuckerberg's belief in virtual reality as a social platform of the future. 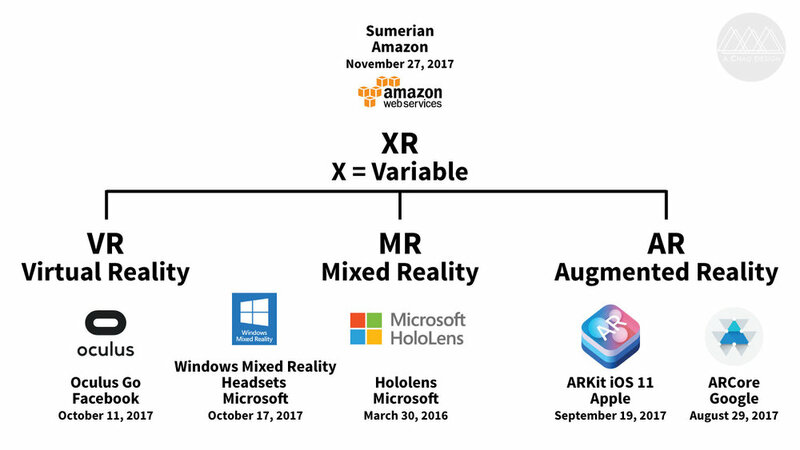 Amazon’s latest platform Sumerian wants to enable building VR, AR, and 3D apps quickly aiming to simplify the creation process to help the technologies spread without subscribing to sides of VR vs. AR. Microsoft's latest Windows Mixed Reality headsets, positioned as alternatives to Oculus Rift and HTC Vive, are named MR but initially capable of VR right now while aligning with the brand's vision of MR as the future where VR and AR will eventually blend together. Has all these realities made the emerging immersive landscape more confusing for the masses? Educating about differences and overlaps helps consumers and businesses alike to better understand possibilities of these technologies as they evolve and shift towards a future interface that may well become as ubiquitous as smartphones. Just as no one nowadays would refer to being on my handheld mobile, we may one day interact fluidly between the real and virtual world continuum without need for names. In the meantime, get immersed and have some fun with visualisations I created to differentiate between the various realities in the current landscape. Virtual reality (VR) is a simulated and immersive environment projected by a device, currently headsets, into the user’s sight and their actions determine what happens in the experience. Augmented reality (AR) supplements our perception of the real world with overlay of digital information such as 3D graphics, animation and photo-realistic objects currently viewed via mobile devices. MR Mixed reality (MR) is similar to AR, however beyond just placing synthetic content over the real world, physical and digital objects co-exist and interact in real time lead by Microsoft's Hololens. XR is the umbrella term referred to as Extended Reality by Qualcomm or an encompassing term where X represents a variable on the continuum across real and virtual. Both intend to reflect the spectrum of realities that may one day merge through a single wearable as breakthrough hardware R&D. Divergent view also exists that believe essentially VR is a new reality, AR is about enhancing reality and they are not on a continuum. Here's a quick visual recap of VR, AR and MR with an invite to join me next post on a journey to immerse yourself in London's XR circles.